The new Star Wars series starring the Dark Lord of the Sith is finding a lot of success in one small conceit: Darth Vader is a lot deeper than anyone thinks. In the movies, Darth Vader is primarily portrayed as a blunt instrument. A fearsome enforcer for Emperor Palpatine who's seemingly content to simply push the old man's agendas forward without any thought for himself. He's not the guy with the plans. He's the guy who makes sure the plans get carried out. But the new Marvel Comics series has made the character a lot more interesting by hinting that there's a lot more than heavy breathing going on under that helmet. Out this week, the latest issue of the Vader series introduces a few new characters who are going to be integral to the Dark Lord's as-yet-secret plans. The introduction of the first starts out the book, with a sequence that pay homage to another famous Lucasfilm hero. An alliance with rogue archeologist Doctor Aphra seems to be giving Darth Vader his own Han Solo, an amoral aide-de-camp who can do all the derring-do-style running and jumping that his own cybernetic legs can't handle. It also marks the start of the kind of close personal relationship that the former Anakin Skywalker probably hasn't been part of for decades. But it's not only humans who are being worked into Lord Vader's machinations. He's also getting his very own droids, as Aphra reactivates two defunct homicidal robots. Built to kill organic lifeforms, they're the exact opposite of Star Wars' most famous automatons. 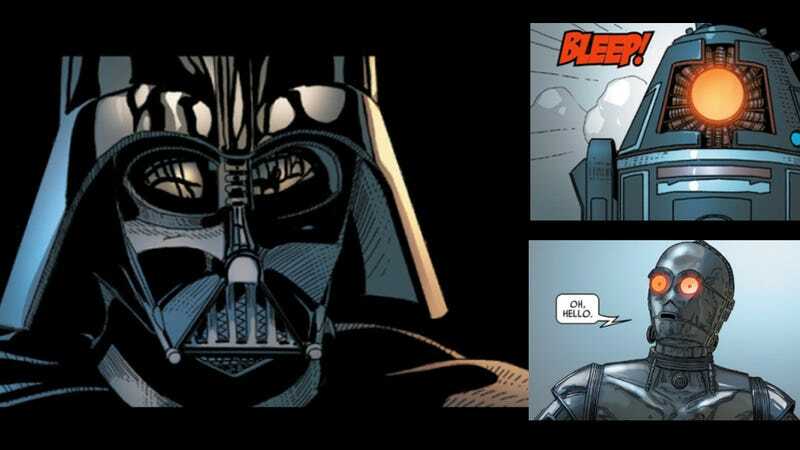 The introduction of Aphra, 000 and BT-1 also give the Vader comic an important avenue for tonal variance. You can tell there's going to be tension and nervous banter now, along with the comedic set-ups that have been the hallmark of Star Wars droids. This isn't just going to be gloomy grown-up Anakin anymore, though there will still likely be lots of that. And, like all the Star Wars comics to ever exist, what makes the broader possibility space even more interesting is knowing what happens at the end of the saga. Whatever Darth Vader's plans are, they're probably going meet some sort of terrible end, which will make the story of Luke Skywalker's father even more tragic.